Reading the Fantastic Four comics from the start. This era of the comic was an ongoing whirlwind of crises and subplots for our heroes, and issue #382 keeps the ball rolling. At the end of the previous issue, a dying Dr. Doom murdered Reed rather than accept his help. Is this issue the funeral, followed by a period of mourning, ultimately establishing a new status quo for the series? Nope. Instead, all the ongoing subplots keep on going as if a major character’s death is just another day at the office. 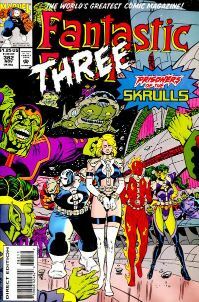 We begin with a short scene of villains Paibok the Super-Skrull, Devos the Devastator, Klaw, and Huntara teleport into the FF’s headquarters. The FF aren’t home, but they find Sharon Ventura, still transformed into a monster, in suspended animation. Klaw says they can use Sharon to their advantage. Cut to Latveria, where all that is left of Reed and Dr. Doom is a pile of ash. Perhaps speaking for the reader, Sue refuses to believe it, and thinks this is a trick. She orders the FF — currently her, Ben, Johnny, Lyja, and Franklin, who is now in his late teens thanks to time traveling — to Dr. Doom’s castle. They take off in their borrowed Avengers Quinjet, fighting their way through Latveria’s air force while Sue explains she believes Dr. Doom and Reed merely teleported away somewhere. Returning to New York, Sue is in full-on rage mode, chewing out Franklin because she still thinks he’s a fraud and not the real Franklin. Elsewhere inside headquarters, Lyja doubles over in pain, revealing that she needs a special medicine called Lacaroo. If she doesn’t have it, the baby she’s carrying will die. Also inside headquarters, Huntara appears through another portal, and attacks Franklin, calling him “Psi-Lord” for the first time. They have a very confusing fight. She accused Nathanial Richards of being a traitor, and Franklin denies it. Huntara then says Franklin must not stand in the way of the “four who must be destroyed,” while Franklin says he won’t let her harm his family. Huntara says she and Franklin have a bond, and that she wants him to return with her to “Elsewhen.” Franklin refuses saying he not a pawn of the “great enemy” who wishes to enslave the human race. Huntara says the enemy is close. She opens another portal and they both disappear. The rest of the FF hear the sound of the fight and rush to help, only for the hallway they’re in to be filled with sleeping gas, strong enough to knock everyone out. Paibok and Devos emerge from hiding and teleport everyone away. Klaw stays behind, with plans for the still-asleep Sharon. Clobberin’ time: The sleep gas takes a lot longer to work on Ben than it does on all the others. He almost reaches a ventilation unit before passing out at the last second. Flame on: Johnny destroys the Latverian plans in a similar manner as he did the Air Force jets way back in issue #1, so much so that it has to be an intentional callout. The enemy pilots follow G.I. Joe rules by parachuting to safety after their planes blow up. Fantastic fifth wheel: Klaw abducting Sharon was originally meant to lead into Fantastic Four Unlimited #5, except that was published before this while referencing events after. 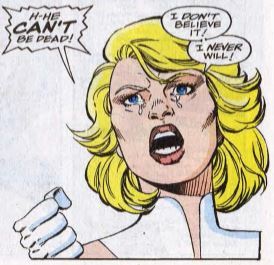 The official explanation is that everyone’s memories were erased at the end of the Unlimited issue, so Klaw is unknowingly abducting Sharon a second time. Four and a half: Franklin finally gets his new codename, Psi-Lord (better that than Tattletale). Also, it’s revealed that he secretly has “hound” tattoos on his face, which he’s hiding via mental telepathy. In the Days of Future Past alternate future, hounds were mutant telepaths used by evil humans to hunt other mutants. Rachel Summers of the X-Men was famously a hound, but I believe this is the first we’ve seen of future Franklin also being one. 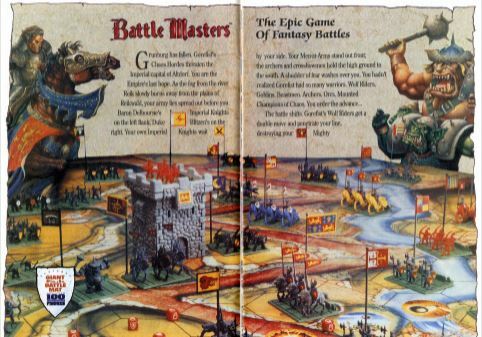 Commercial break: Milton Bradley purchased not just two but three whole pages’ worth of advertisement to promote this Battle Masters game. Have any of you played it? Was it worth it? Trivia time: The Marvel wiki insists that the Skrull Throneworld is the same world as the planet Satriani, seen in Silver Surfer #31, in which the Empress S’Byll took over leadership of the Skrull Empire. Fantastic or frightful? It’s incredulous how dismissive this issue is about Reed’s death, with the creators all but saying “Yeah, we all know he’s coming back.” If this is the attitude, then better not kill a main character at all. On the plus side, the story picks up nicely in the second half of this issue, with Devos’ betrayal and attack feeling appropriately big and dramatic. Next: With Malice for all.